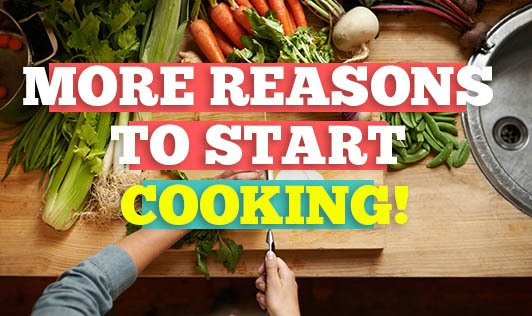 More Reasons to Start Cooking! Cooking is a day-to-day routine which is followed in most homes. It is an art which not only satisfies our hunger but also provides several physical, mental and emotional benefits. 1. Cooking stimulates our senses: Cooking makes us feel alive by stimulating the 5 senses. The sizzle and smell of onions, the feel of different textures and tastes of different flavors and the sight of a combination of colours make us feel rejuvenated. 2. Cooking brings out our creative side: Cooking gives us a chance to play with different flavors and colour combinations. It also helps us in finding new ways to use various ingredients. 3. Cooking helps us build relationships: It is a way of expressing our feelings to someone. Cooking with our loved ones will help us build strong bonds and keep the relationship healthy. 4. Cooking is a great stress-buster: Cooking helps us relax and overcome our worries, depression, loneliness etc. It's a great way to keep yourself occupied when you aren't in the best of your moods! 5. Cooking helps us eat healthily: Cooking helps us to avoid eating junk foods and also helps us select fresh and healthy ingredients. It brings variety into our diet. It provides protection from food and water-borne diseases which can otherwise be contracted from eating outside food. So, now you have a better reason to spend more time cooking! After all, cooking is not just a mundane chore, but an activity that could give you several benefits too! Are you cooking already??? ?